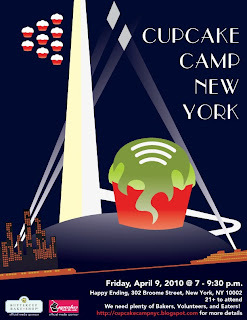 Blondie and Brownie: CupcakeCamp NYC 2010 is Coming This Friday! CupcakeCamp NYC will feature the lovely ladies from Cupcakes Take the Cake, Kathy "Metalcakes" Bejma and cupcake author, Jennifer Ross and will take over Happy Ending for the second year in a row for 2.5 hours of cupcake love, this Friday, April 9th. Follow this link get on the wait list. All the details are available on the official Cupcake Camp Blog.